This program aims at training those who will take responsibility for child protection activities. holle, everyone, I am yamamoto. I will talk about [protecting children in the community] during the following 20 minutes. As the saying goes, children’s health, the nation’s wealth. It becomes meaningful especially when the decrease in the number of children is progressing. Needless to say, children are physiologically powerless and defenceless , should be protected. 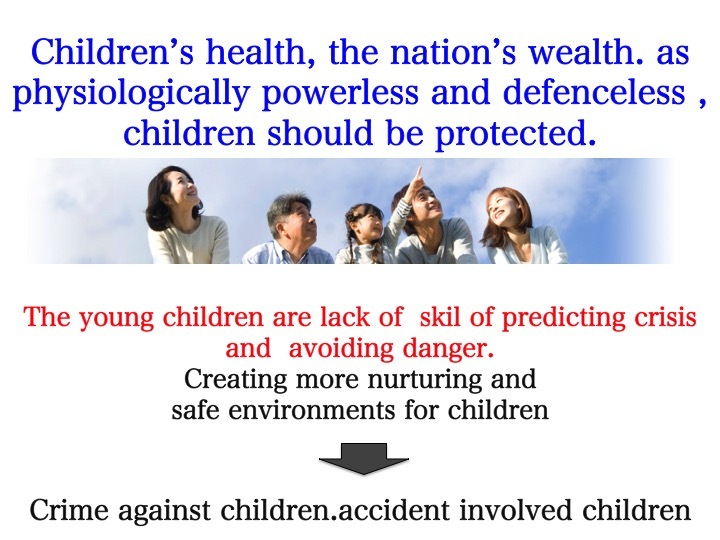 especially for the young children, who are lack of skil of predicting crisis and avoiding danger, chance of developing their social skill becomes fewer. Furthermore, big changes happened on urban neighbourhood space for childhood comparing with that of our ages. In such modern age, tragic incident or accident tend to happen. Today, we are gathered here, I think most of you are contributing in diffirent fileds on your position. 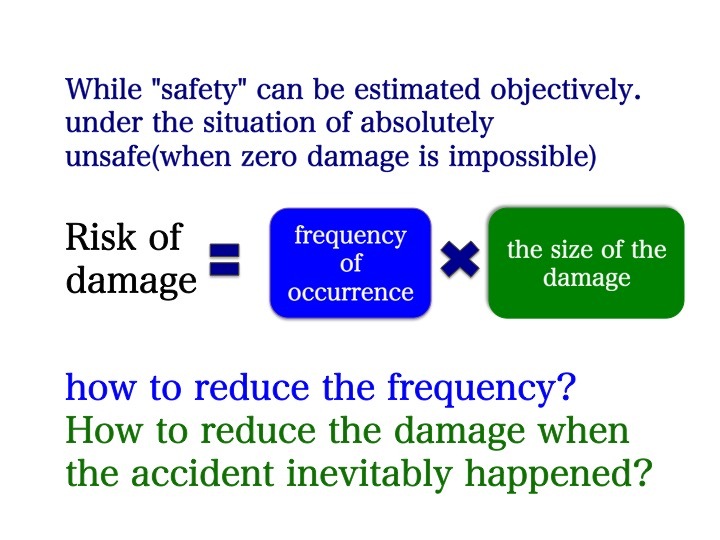 Though various measures would be taken when accident happens, extreme measure would bring forcibleness. An irregularity is born for an action without lasting long when it is conducted under forcibleness . In this situation, tragic incident would happen. However, over protection is not good for all-round development of children. The community safety inspection map making program are in progress throughout the nation, also in your areas. It used to be drew by adults untill transfered to children ten years ago in consideration of promoting children’s danger avoidance abilities. However, we should avoid intensely critical or it will become a dangerous place finding [dangerous map] making work. 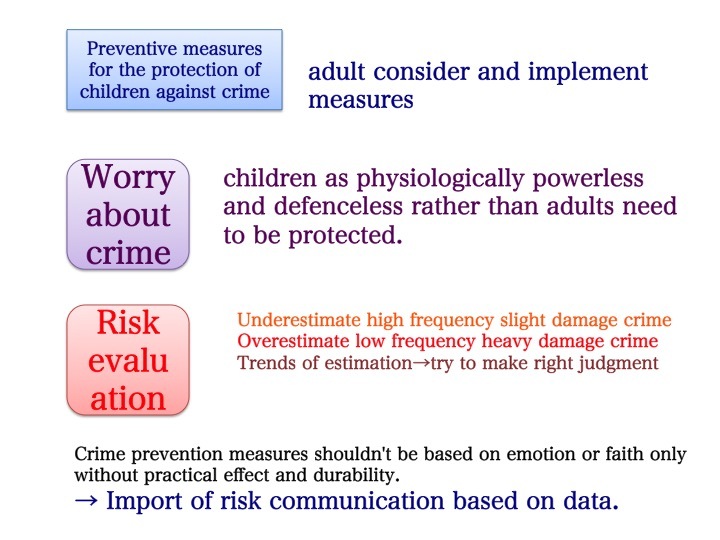 next, I will talk about measures for the protection of children, there are three characteristics. First, parents should consider measure for the protection of children and practice it. Secord, worrying about crime impels us to explore measures, especially worry frequently about the children or relatives being harmed rather than worrying about ourselves. Third, frequent crime patterns causing little damage tend to be lightly estimated, while a rare criminal case will be over estimated while it caused more damaging. So, it is difficult to estimate risk properly or pass a fair judgment. Though safety and feel relieved are always talked together, they are by no means the same things. I have ask `what`s the difference between the words safety and feel relieved? 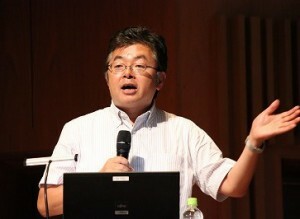 to my colleague Masaru Kitano, who has taught Safety Theory at our college until this March. Then he followed up with yet another question`how do you think if you ask my brother? `. What would Mr Kitano answer me? and how about you ? Mr Kitano hit the mark with a singl comment, he answered me the words are different. Yes feel relieved describes the feeling from heart, it relies on subjective judgment, at the same time, relieved feeling is related to trust. In other words, distrust caused uneasiness. The other side, safety can be measured objectively. I work at the Department of Science and Technology Meiji university, it makes me used to measure things physically by distance and time. 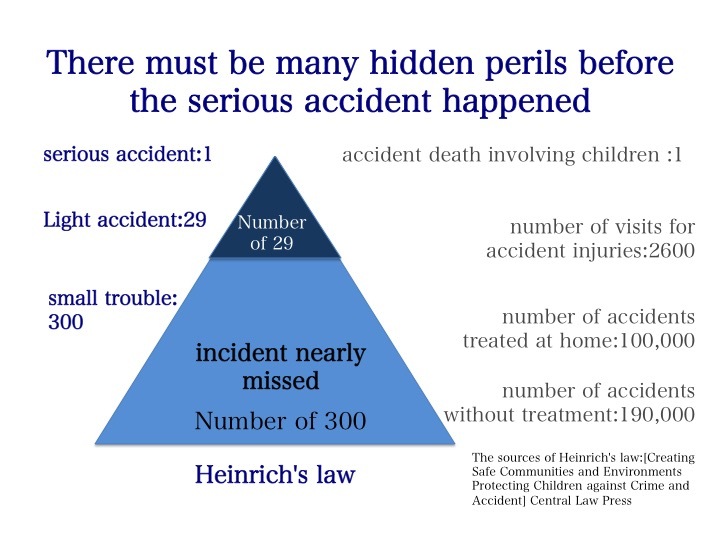 I have just heard from police officer Mr Ishida there is average one criminal case including serious accident involving child victims every day.For workplace accidents,there is a well known empirical finding called Heinrich’s law:that in a workplace,for every accident that causes a major injury,there are 29 accidents that cause minor injuries and 300 accidents that cause no injuries.For the accident to children,it can also find some laws,for example how many background cases of one death accident can be estimated.Criminal cases are same as accident.It is to say,it’s an approach to avoid serious accident by reducing no injuries accidents. 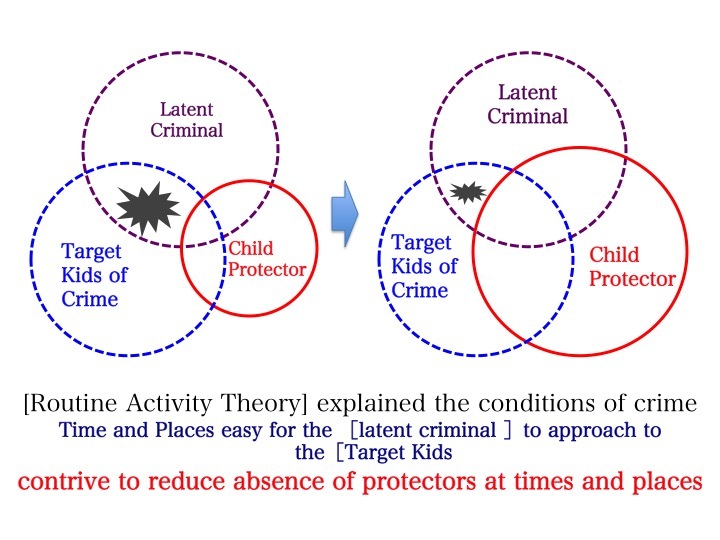 The theory of [When and where will crime or misconduct be committed](Routine Activity Theory) stipulates three necessary conditions for most crime,”a likely offender”,”a suitable target”, and “the absence of a capable guardian” coming together in time and space.According to this theory, suitable target opportunities for criminal approach to are in a certain range and capable guardians can protect this certain range of “suitable target” effectively to reduce criminal opportunities,besides,it is impossible to patrol everywhere all the day.The other side,criminal commits crime as well as weighs the risk of exposure.Anyway,it is important to try our best to creat a easily patrolled environment. There is no trump card on crime prevention. Talked too much theory,then comes some living examples.Since I major in Architecture• Urban design,views from urban planning: a shopping center was built on the vacant lot where a factory building used to be.There are ornamental trees planted and old concrete block wall around the factory site,graffiti on the concrete block wall never stopps,in addition the new built bus station aggravates crowded conditions.The other side,many kind of crimes such as vehicle break-in and theft of the on-vehicle unit occurred in parking lot of the shopping center. So how to cope with these problems? The building site of the shopping center is broad, assume that remove the concrete block wall then move back from boundary to plant hedge as the graffiti will be reduced. 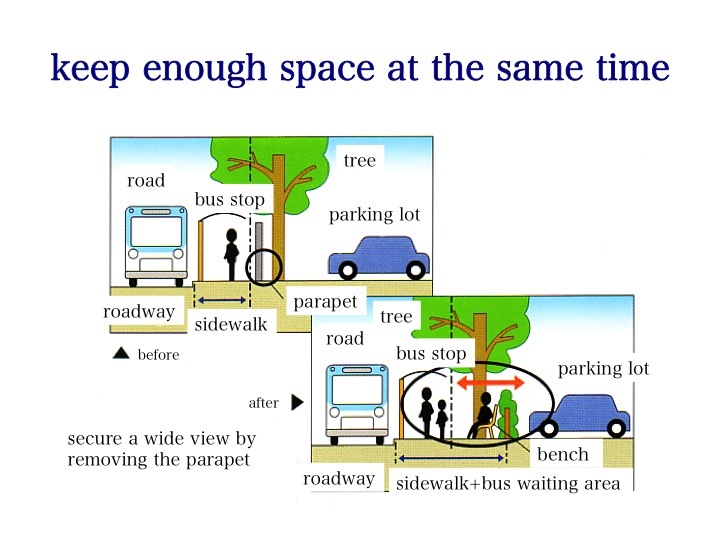 Next,put bench under a tree to provide rest space in the shade of the tree as well as from the bench can look over the parking lot.Moreover,the bus station space also can be expaned.There are also many places in your community can be improved to be easily being protected and comfortable places.Though it may take some cost to do such improvements. Mr Takano has just talked about the traffic accident.It is still well within the memory of me that children killed or injuried in terible traffic accidents occurred on their way to school,separately in Kyoto Kameoka-shi and Chiba-ken Tateyama-shi.After these two tragic traffic accidents,police officers, schools and communities worked in coopration with each other to inspect dangerous spots. Security measures have been taken seriously for many years in Kameoka-shi,but the tragic accident occurred.The accident happened on the prefectural road,where there was no speed limit.Now there are safety devices set on the road for narrowing parts of the road and slowing cars down on cross road.It is also as a social experiment.The security measures for protecting chilren slow cars down as well as make the road safe for elderly to take a walk safely.Then increasing flow of people also improves protection of children on the road. 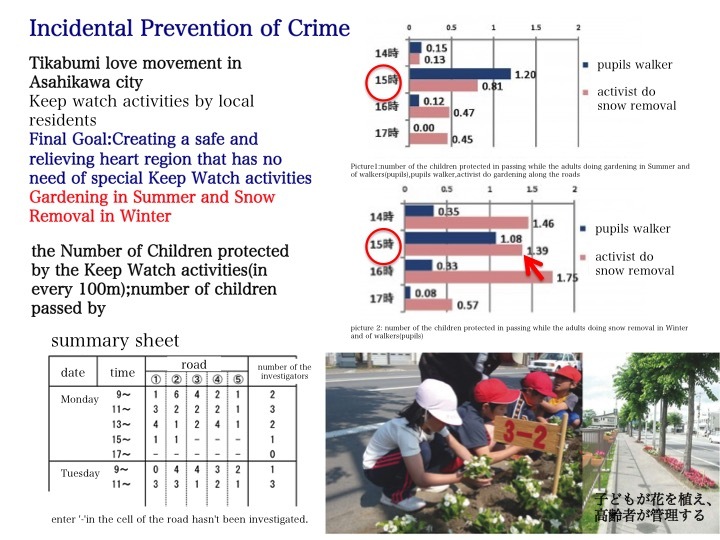 I think most of you have taken part in Mimamori(keeping an eye on children)activities or conducted crime prevention patrol.But time is limit,especially it is always difficult for us to squeeze out time during the school finish time around 15:00-17:00.Next,I will talk about an example of Hokkaido Asahikawa city,where safe community development proceeded well without special Mimamori activities during last ten years.As snow country,snow removal is routine in winter,while gardening is an enjoyment in summer.I searched [Mimamori amount] to find out when did they do these works,then got that someone did them during school finish time,someone did at other times.The key is information about when children are on their way home from school is provided. By the way,the elder also wish to get help in an emergency.Social welfare committee makes efforts to create connection between elder and families with children. One method is encourage elders to conduct routine work in school finish time for keeping an eye on children without extra effort,which is known as ‘love action’in Chikabumi area. 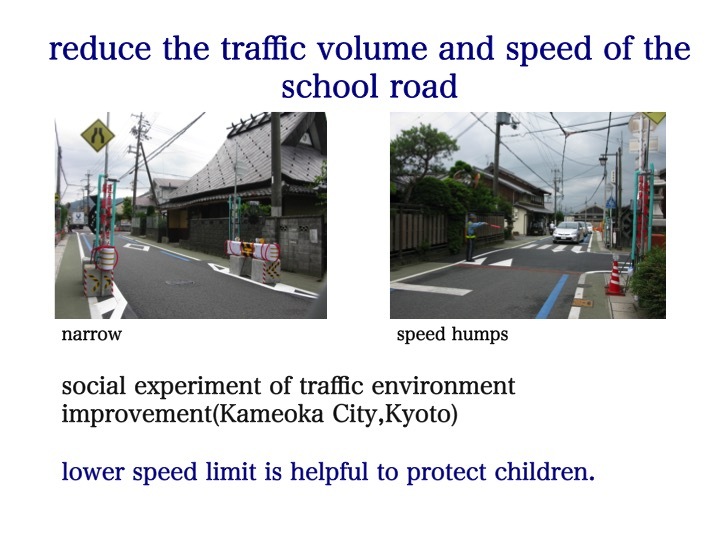 I think there are opportunity to discuss a feast or a disaster in centers round primary school or middle school with members of your community.Protect children not only an individual issue or school’s responsibility, but a community concern as well.The crossing guard in Nerima-ku case stood at the crossroad is also as a Mimamori method of guiding children. 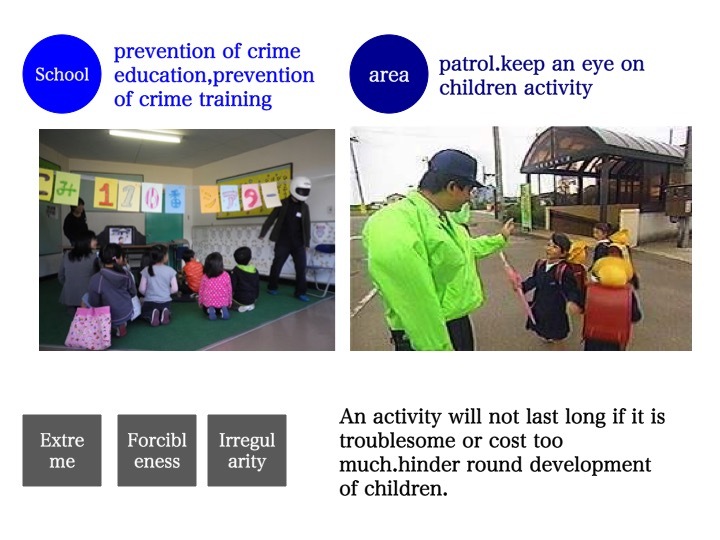 Different communities have different problem as the number of children and feature of street are different.For these reason, Community Safety Inspection Map Making Program has been conducted and this creates a communication platform for schools and parents.The problem is though many people know the Mimamori method but there are still someones have nothing about it. As i have talked about the gardening work and snow removal, various activities connecting with protection methods can be found in daily life.It is called ‘plus protection’,and possible protection methods should be list and put into practice throughout the whole country. 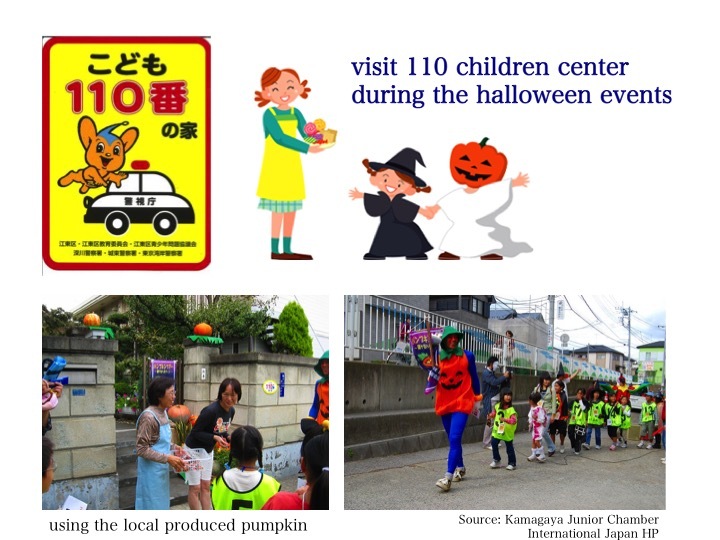 There are [110 children center],and Pepokun’s mascot home in Tokyo.The Junior Chamber Chiba-ken Kamagaya-shi seize the chance of halloween events to conduct a sales campaign with 110 children center to sell pumpkin produced in this area for long years. They visit residents in costume during halloween event.For 110 children center, they promote children to know who live in 110 children center.I have asked a child ‘will you go to the 110 children center? ‘,the child replied ‘I won’t because i was told can’t go to strangers’s home’.That’s right in some degree,so we find some methods like the ‘halloween visit’to encourage children to know more about the 110 children center as an emergency shelter as well as enjoy halloween,in addition connect with farmers. 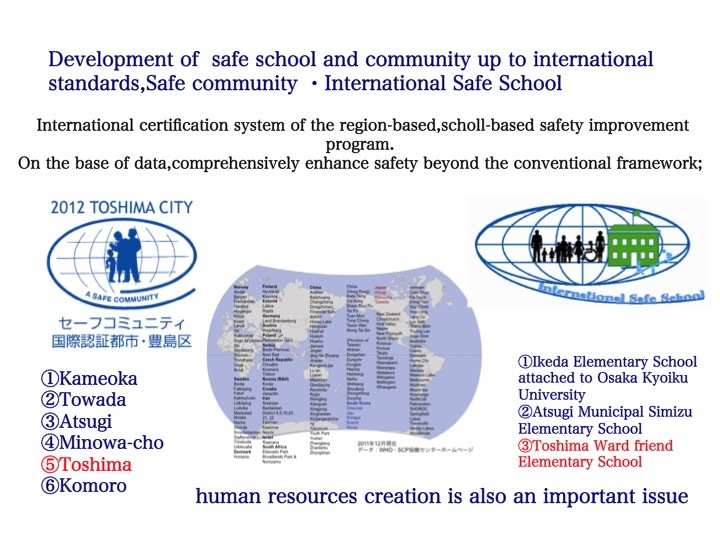 Toshima-ku has got the international certificate of safe community,international safe school last year.There is no time to talk the details about it.We promote safety programs on a community basis or shool basis.The application of these cetifications requires at least 2 years activities efforts.What kind of activities should we do,one is to evaluate（？）、plan a program base on data.The another one is promote safety program dealing with virious safety issues.Training successors who will take over the responsibility is also an important subject. Talked too much,but the essential thing is begin from what we can do.Though exchange greetings is basic,sometimes we are too shy to speak to strangers.But look at the face of strangers is a warning look to potential criminal.Do what we can to promote children’s health and safety.Thank you for listening.